If you happen to be British, know someone who is British or happened to watch BBC America at all in the past two weeks, you probably know that today is the Diamond Jubilee of Queen Elizabeth II. It is a huge celebration of her 60 years of reign in Great Britain. Tim is English, I'm half English, and for the last jubilee (10 years ago) I was in England and remember fondly all the celebrations that took place across the country. So, obviously today I went running. For the Queen. After yesterday's speedy-for-me 10k (in 57:58) I decided that I could hang with the faster runners at the Sunday morning group run. For the record, I can't. But Tim and I kept them in sight the whole time and in the process, I set a new (and completely unofficial) 5k PR. Just over 4 miles, and the splits were: 8:20, 8:33, 8:58, 8:59. Um, yeah. I haven't hit those times in roughly a gazillion years. All day I have been elated. I thought yesterday might be a fluke, but it's official - I'm back. The iron is kicking in, the little stomach parasites are no longer able to call my guts their home and I feel freaking fantastic. Honestly, the ear to ear grin I have is probably starting to annoy Tim, but I don't care. It's like running and I were separated and living in different houses, staying together in name only and telling our kids that we were working things out. And then we got back together with a romantic weekend away and it feels like young love all over again. I may have taken that metaphor too far, and I apologize. Suffice it to say, I love running again. My mood also may have been helped by the realization that I CAN eat chocolate, unlike I previously thought. I can't eat soy, and soy lecithin is in chocolate. I cried a little, but got over it. Today I was re-reading my allergen information and it clearly states at the bottom that soybean oil and soy lecithin are fine. So I celebrated with some Cadbury's...again, for the Queen. I also baked some gluten-free scones this afternoon. So easy and so delicious. I haven't gotten the hang of using the various gluten free flour mixes yet, so instead I used a box mix and added butter, eggs and this chocolate/coffee/milk mixture that Tim drinks. They turned out amazingly and I actually felt good to do something sorta kinda British and enjoy a scone with a cup of tea this afternoon. 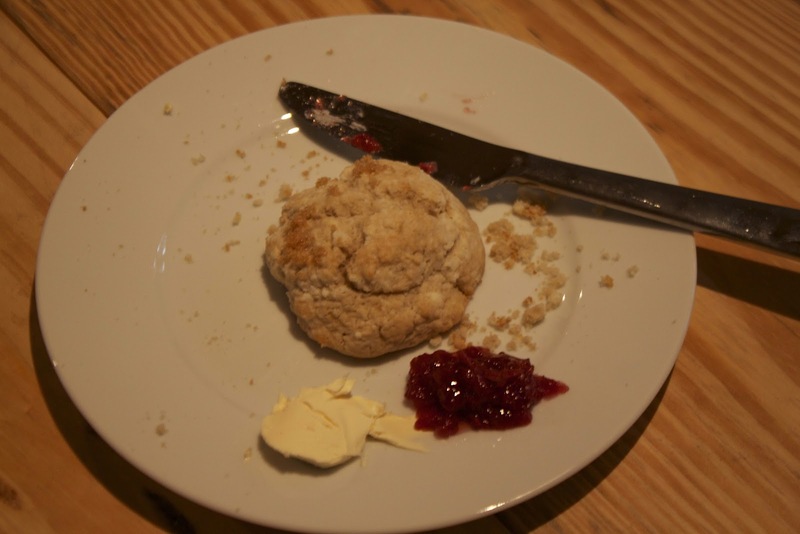 For the record, scones are not meant to be eaten plain. Ideally they are paired with clotted cream, but the next best thing? Butter and strawberry jam. 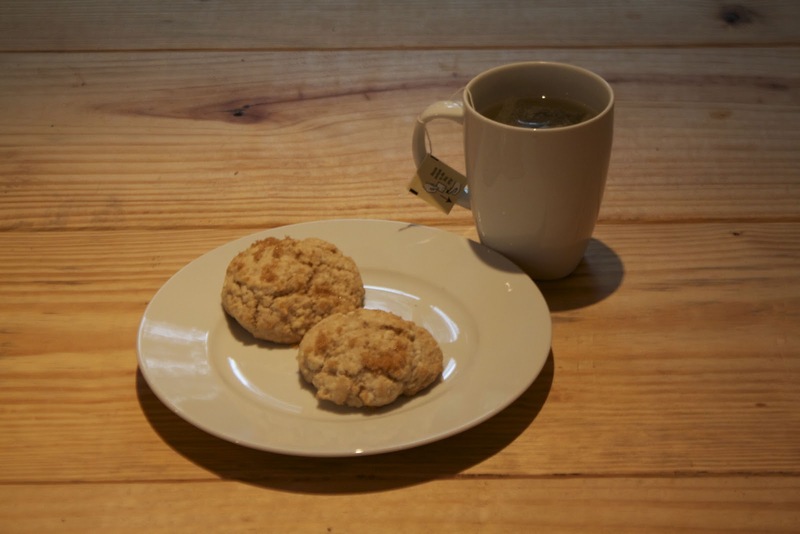 Are you a fan of scones? Have you made them yourself? I love them so much! Usually I make them with dried fruits or nuts but this slightly sweeter batch was amazing too. Anyone do anything special for the Queen's Jubilee? If not, now is your chance to toss on that tiara and practice your queen wave. Don't lie, you've done it. Glad you are back and feeling good! I haven't had scones since my bridal shower last July. My in laws threw me a tea party shower. Thankfully another girl in my in laws family is getting married this year so I get to go to another tea party bridal shower and have more scones! I don't normally like scones. It's like a biscuit that didn't turn out right. I also hate biscotti. Basically I like food that brings moisture to the table. No dry crackery free loaders. I'm so glad you're feeling better! That makes me happy happy happy! Hey, I have nothing to celebrate over here, so let me live vicariously through you, mkay? Oh, and your metaphor literally had me laughing out loud. I can't say I've ever tried a scone. I love scones but haven't made them because I'm lazy! Yay for the great runs, I wish I could fall in love with running again, we're going through a rough patch! I'm very sorry to say that I don't like scones which was frowned upon when I lived in England, I don't like olives which is frowned upon by my Greek husband's relatives and I don't like meat pies which is frowned upon by Australia where I live - maybe I should move to Mexico or Italy!! First, congrats of being back! Love the look of determination on your face. Scones, I have to be in the mood for them, but when I do my favorite is at the coffee shop inside our Barnes & Noble. They have the best orange and cranberries scones. For the Jubilee I watched a bit on BBC America but I also followed the celebrations through Instagram and it was so much fun to see pics of the celebration but also how people celebrated. You are such an inspiration lady! 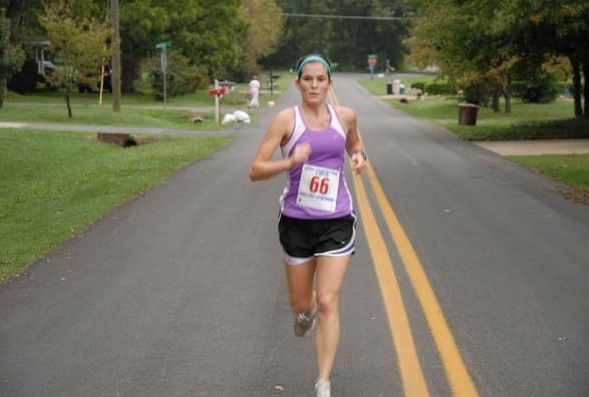 Nice job on the 5k! Glad the parasites are at bay. I love scones, but rarely make them because I'll eat SO many and make myself sick. so happy you are feeling better! :) welcome back. Way to go on the speedy run! I wasn't sure if I could come back to your blog since you shun TWSS but I made it. The scones look amazing and you most definitely deserved them...and the chocolate! Hurray for young love. 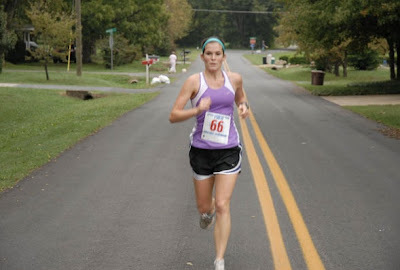 So happy for you to be feeling better and finding your love for running again. I do love scones. And yes, being Canadian, we are very excited for the Queen's Diamond Jubilee and have been glued to the celebrations.. particularly loved Kate in scarlet on the yacht yesterday! FRIEND!!!!!!! this post. LOVE. love how excited you are and your energy! seriously. how awesome! im so glad you are finally feeling like YOU again and loving running!!!!! wow!!!!!!! How fast are you getting!!! YEAH YOU!!! I'm sooo excited for you!!!!! WOW!!!!!!! Congrats on finding that inner speedy mcspeedster!!!! I watched the floatila - pretty cool. used to love love scones!!! for the Queen...hmmm I will watch the concert on TV and drink tea! Saying I love scones is an understatement. Love. I can't make them though...My favorite are lemon ginger....they will make your mouth happy. Yay! I'm so glad you are feeling better! I will definitely have to try to cocoa almonds, thanks for the recommendation! Woo hoo for the PR. I like scones! You know which one I don't get though? Crumpets! They are a pancake. Or an English Muffin. I am not sure what. But when I was trying to explain to my Australian friend that our biscuit was similar to a scone and her crumpet was like a muffin, we all were getting quite confused. I'm so glad you are feeling so much better Vanessa! Sounds like this is going to be one of many great runs for you. I'm pretty sure I've only had a scone once or twice but they do look really yummy! I haven't visited your blog for the last week, so I'm VERY happy to hear you're feeling so much better!! Bummer about the wheat allergy, but there's so much GF food out there, that hopefully it won't be too bad. Glad your running mojo is back! I haven't gotten the hang of using some GF flours. .. or rather, there are some things I can't seem to make and turn out well using the flours I use, so I use a box mix. Namely, banana bread. For whatever reason I can't do it from scratch now, so I use a fabulous GF mix that is just tapioca flour and some other things. I also avoid soy, and have been avoiding beans, which means my favorite GF mix I can't use any longer as it has bean flour in it (my eyes are puffy the next day, so I just avoid it). their banana bread and scone mix for a few. Sorry you can't do soy, as that has to be touch for chinese cooking, but the fun is to experiment with new ingredients and foods! If you can do almonds, you MUST try and Pamela's Pancake Mix. . . it's simply the BEST and all my gluten eating friends love them. It has buttermilk in the mix already. i'm glad you're feeling better and i'm sure the queen appreciates your speedy run! my grandma is english and was trying to explain all the celebrations to me the other day! I used to live in Ireland and DIE for the scones over there. They aren't close to being the same here. There is nothing better than a giant currant scone with some butter and jam and a cuppa PG tips.